The four bin soft-close bottom-mount trash can features a specialized wire management system that holds the bins securely in place. All units slide on KVs heavy-duty, full-extension ball bearing slides and Soft-Close technology. Bottom-mount units are pre-assembled for faster installation. Includes an easy to attach Snap-On handle. 22 X 23.375 X 19 In-Cabinet Four-Bin Soft-Close Bottom-Mount 27 Qt. 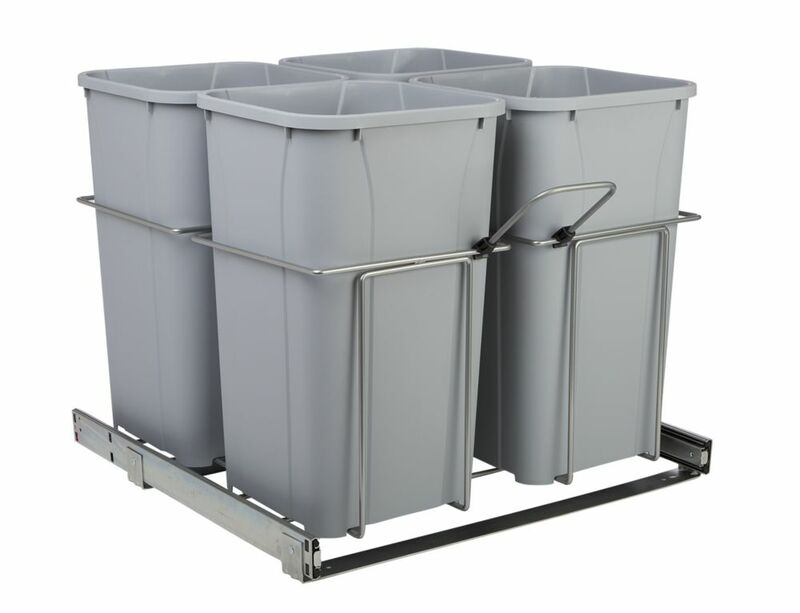 Pull-Out Trash Can The four bin soft-close bottom-mount trash can features a specialized wire management system that holds the bins securely in place. All units slide on KVs heavy-duty, full-extension ball bearing slides and Soft-Close technology. Bottom-mount units are pre-assembled for faster installation. 22 X 23.375 X 19 In-Cabinet Four-Bin Soft-Close Bottom-Mount 27 Qt. Pull-Out Trash Can is rated 4.0 out of 5 by 1. Rated 4 out of 5 by tttt from works really well slides really smoothly, helps save space. i actually use it to sort laundry instead. i feel like it's a bit expensive for what it is, but in the end it works well and it fit perfectly into my small laundry room. Do you sell lids for the Knape &amp; Vogt 4-bin grey pull-out trash cans SKU #1000830868? Unfortunately we do not currently offer lids for these units. Do these bins have lids or are they open? I need compact bins for recycling - 4 of them in total.